The Gerber Baby, a nightmare-inducing baby that Gerber saw fit to plaster all over its baby food products. Those cold dead eyes and doll-like expression seem to have been the face of the Gerber company since before time began. Most people see the child’s face as a cheeky cherub, but whatever your opinion, no doubt you will recognize it. But where did the baby come from, and where are they now? Have the company updated the image? We have the answers to the questions we just posed – it would probably be a bit mean if we didn’t really. In 1928, Gerber wanted to find a new image to call their own. They launched a competition asking artists to design their new baby food logo. Inundated with pictures, the company had to set about deciding a winner. The winner of the contest was Dorothy Hope Smith. She had actually intended to finish the charcoal sketch she sent in, but the upper echelons at Gerber figured a half-finished sketch was the picture for them. The sketch was trademarked in 1931, and the rest is history. 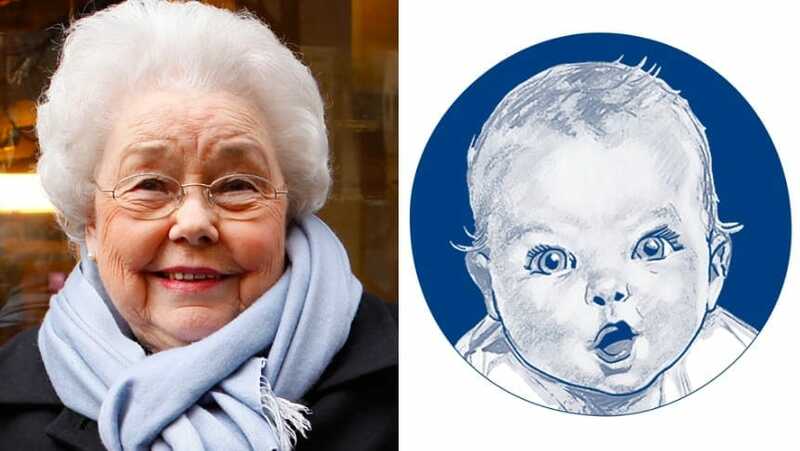 The focal point of that sketch was Ann Turner Cook, hers was the face that helped launch Gerber’s baby food empire. Cook’s mother used to tell her when she was younger, the infant on the bottle was her, something she had no trouble believing. Ann always thought that she could see herself in the image and trusted that it was her. Cook is now retired, having spent her life teaching. She resides in Tampa, Florida. Ann’s identity as the Gerber Baby was kept secret for many years, 40 in fact. People began speculating about who the baby was and what they looked like now, they had to wait until 1978 to find out. Many guessed it was a famous child, like Elizabeth Taylor or Humphrey Bogart. Cook felt she didn’t want to draw attention to herself at college, so she didn’t tell anyone until she was older. She saw it as the artist’s accomplishment and not her own. During her teaching career, Cook managed to write several mystery books. The titles include “Trace Their Shadows,” and “Homosassa Shadows.” Now that her identity is public knowledge Cook isn’t shy about sharing that information. She says that she does so to get people interested, but she doesn’t think the knowledge helps her sell any more books. Is she still the face of the company? Not anymore. Society changes and Gerber is no different. Nowadays the Gerber logo changes to reflect the transformations in society. In recent times the image has featured babies from different ethnicities and races. Gerber made it a priority to make sure their image was more diverse, to appeal to a broader range of customers. Gerber’s 2018 baby is Lucas Warren. Young Lucas is the first child to be named as the Gerber Baby to have Down’s syndrome. That’s it, the beginning of the Gerber Baby, where they are now and who the current baby is. Hopefully, you have enjoyed the brief history of the Gerber baby.